If you’re of the “big hands” persuasion, this mouse might be just a bit too dainty for you, with the buttons a bit too difficult to mange, and the tilt-wheel a little too tiny to get a grip on (especially when tilting sideways). So yes, it’s small, but that’s sorta the point. 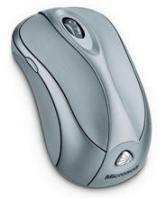 So if you accept that fact, you can’t really beat the smoothness combined with portability that this mouse offers you. And at only around 50 bucks (CAD) it sure beats most of the Bluetooth mice out there.